With the Republican Party maintaining control of both the House of Representatives and the Senate, and President-elect Donald Trump preparing to assume office, their long-sought goal of repealing and replacing the Affordable Care Act (ACA) is likely going to be an early, primary focus for the new Administration and Congress in 2017. Once in office, President Trump could make immediate changes through regulation or executive order, such as eliminating cost-sharing subsidies, but at this time indications are that both he and congressional Republicans prefer to limit disruption. While Congress considers next steps regarding health care reform, it is important that we do not overlook the opportunities of a replacement plan. 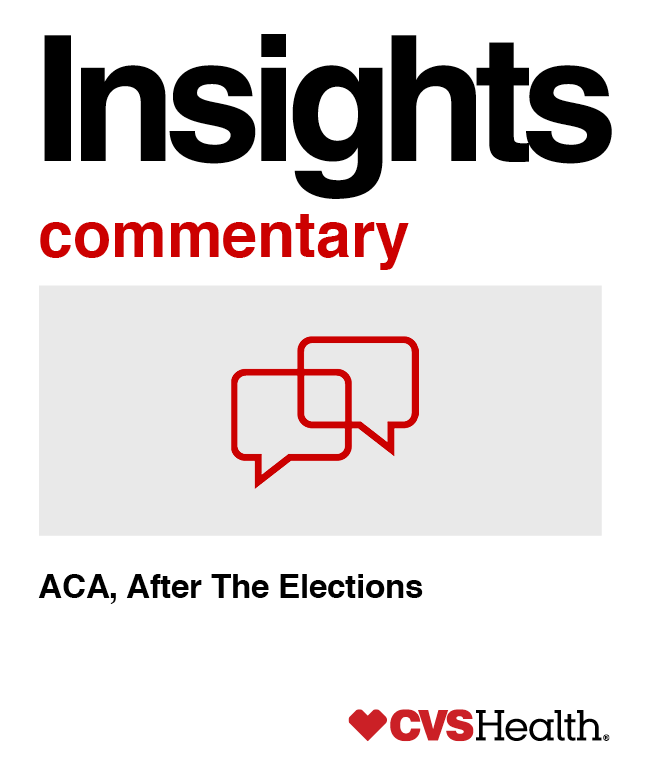 We should keep in mind that this election presents an opportunity to make changes to the ACA that could favorably affect payors and CVS Health’s ability to help them manage costs – such as revisions to burdensome regulations and improvements to the functioning of the individual health insurance market. While we do not yet know all the details, we can draw some potential conclusions based on recent legislative proposals. The rhetoric has emphasized repeal, but we expect that the policy debate will be dominated by the replacement of components of the ACA. Congressional Republicans have indicated support for a number of current ACA policies. This past June House Republicans unveiled a proposal that would repeal the ACA while maintaining its pre-existing condition provision and allowing dependents to remain on their parents’ insurance until age 26, as well replace the current 3:1 age rating band with a 5:1 band. It would abolish the exchanges and grant tax credits to all customers purchasing coverage in the individual market, with older individuals receiving larger credits. At least $25 billion in federal funding would be made available to states for high-risk pools. The plan would allow consumers to purchase insurance across state lines, something President-elect Trump championed during the campaign. It would also promote consumer-driven health plans by abolishing ACA-imposed restrictions on health savings accounts (HSA) and expanding their use. Many Republican governors also are strong supporters of the ACA’s Medicaid expansion and are likely to lobby Congress to retain it in some form. We are in the early days of this debate. As policy discussions evolve we look for your input and perspectives, and will share ours. Working together, we can help to shape a replacement of the ACA that works for clients and their members.